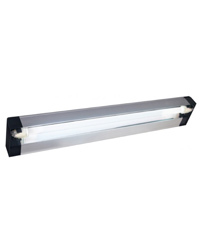 Arcadia Slimline Vivarium Luminaires are now available pre-fitted with 6% (D3, Forest), 12% (D3+ Desert) and 14% (Dragon Lamps) High output T5 lamps. The All-in-one design, purpose built for wooden vivariums & terrariums, includes the T5 lamp, ballast, lamp holders and reflector. Single mains cable with no messy cables but has the option to connect multiple luminaires with link cables for large or multiple enclosures. Available in 24W and 39W versions in all three lamp types.